My kids love Lonsdale Quay. For the ball pit? Yes, partly. The various sights and sounds? That too. How about the spectacular view of Downtown Vancouver? I suppose. Actually, they love the place because they can get Beaver's Tails. Well, not anymore apparently. That's what we discovered when we walked up to it. Replaced by O Mini Donuts, my son was not a happy camper. However, it didn't take him long to get over it as we promised donuts after lunch. 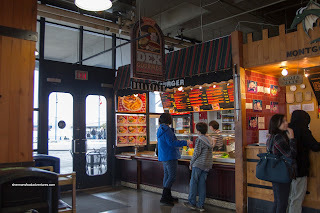 And as for that lunch, we decided to try out another one of the food stalls - Dex Gourmet Burger Bar. 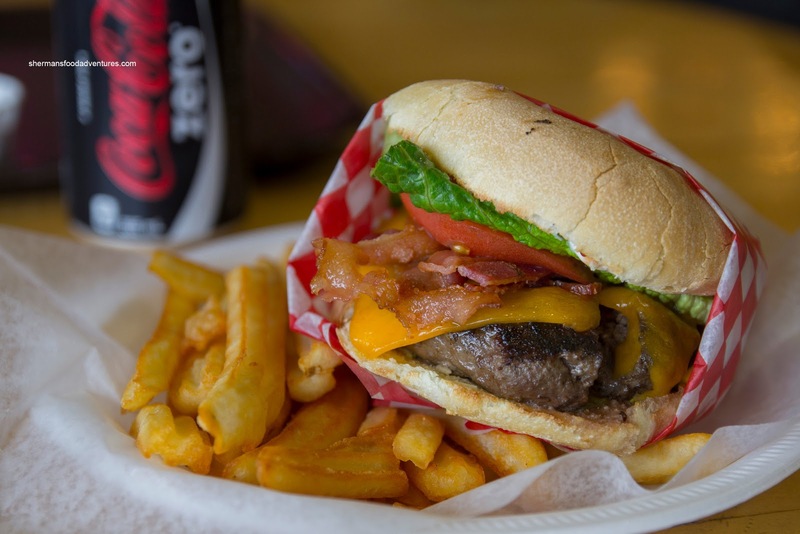 For myself, I decided on the Bacon Cheeseburger with a side of fries. 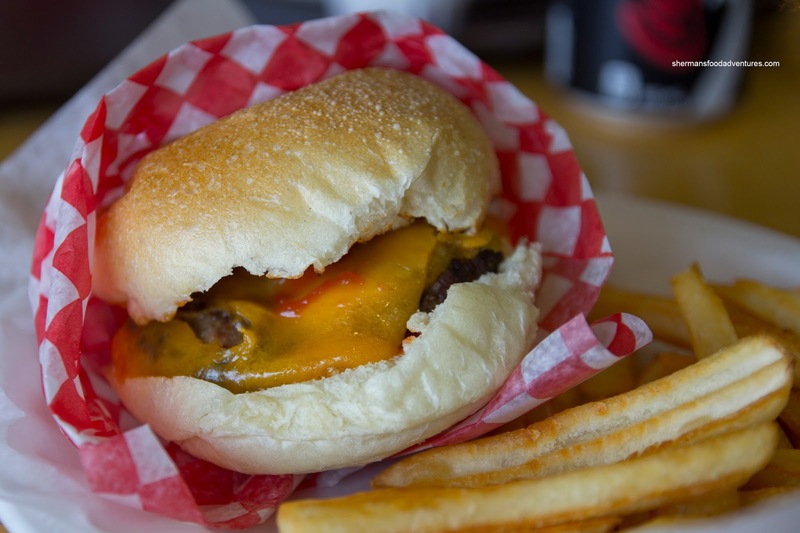 The fairly large beef patty was cooked all-the-way-through, hence it was mostly dry. 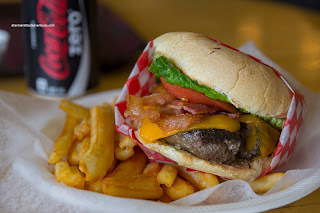 The burger was quite greasy which actually helped alleviate some of the dryness. The bacon was decently crisp while the use of real cheddar was welcomed. The Cob's bun was fresh and held up well to the ingredients. As for the fries, they were fried golden crispy with lots of soft potato inside. My son had a similar order in the Kid's Cheeseburger. Despite being the kid's size burger, it was still fairly large. Since the burger patty was a bit smaller, it was even more dry (and somewhat chewy). He didn't end up finishing it because it was too much food. Okay burgers, but hardly gourmet. Now onto what he had his eye on as we were eating lunch - Mini-Donuts! Much like the ones you'd find at the PNE (but not exactly), these were fried fresh and served either plain or with cinnamon sugar. We went for the latter. Naturally, these were warm and soft. They were just a touch more dense than Those Little Donuts, but we still liked them. Overall, it was an enjoyable visit to the market. Can't say that the food was stellar, but it did the job. Yeah the Beaver Tails are no more, sad to say :-( I'm surprised they didn't last, or have other outlets in other parts of G. Vancouver. Our loss. LQ's food court shines in comparison to Granville Island Public Market's, which IMO is stuck in perma-MEH and in the '90s, while losing value altogether ($9 for 3-item Chinese grease combo; $4.50 for slice of pizza; etc, etc). If your son likes those mini donuts, and who doesn't, have you tried the ones in Steveston? Their glazes are very creative and the donuts are very light and crispy. 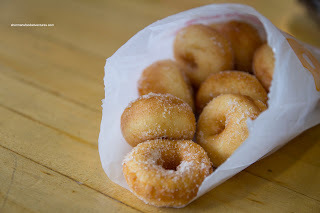 @holly - just had those Steveston mini donuts recently (Outpost) and they were goooood. Problem is, I harked down half a dozen in a couple of mins, which was not wise on its own, let alone after a big lunch meal at The Hog Shack. BTW, The Hog Shack was a *HUGE* disappointment. Talk about over-hyped. @LR I can't believe you downed those mini donuts after eating at the Hog Shack. You're an eating machine. I'm glad I'm not the only one who feels disappointed by their BBQ. Unfortunately, they don't have much competition. @Holly - I *wished* I'm an eating machine like Sherman (that's a compliment btw Sherman) but I'm not. My eyes were way bigger than my stomach that day and I suffered for it ! But I guess since I already "pigged out" at The HS I may as well just keep goin'. @Sherman - agree on PICA and EC at Granville Isld. It's the food court that's really a downer. Yes I expressed the same sentiments on CH-BC. Kim & Sherman - you're both eating machines. I am not worthy ! !